Whilst the Israeli PM was busy using propaganda cartoons at the UN to prepare the brain washed masses of the world for an attack against Iran's nuclear infrastructure, in addition to the raging cyber war, the currency war against the Iranian elite has continued to accelerate as the US elites succeeds in decoupling Iran's central bank from the global central bank crime syndicate that manages the relative rates of free fall amongst all fiat currencies to give the illusion of currency stability which has sent the Iranian Rial literally into free fall. 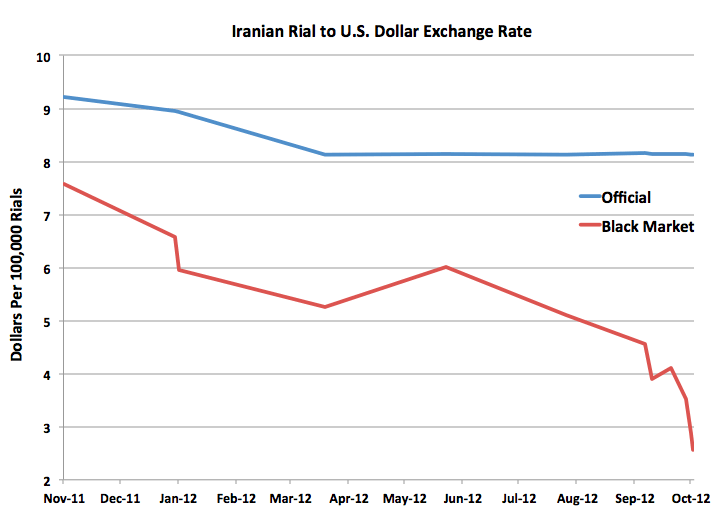 Whilst the official Iranian central bank rate for the Rial remains stuck at a rate no one can actually trade at, the real rate that people actually live with continues to collapse by falling by more than 25% in just 1 week, and by 70% over the past year (against USD), where apparently the decline is being accelerated by all things the inauguration of new currency trading centre just over a week ago! Which has allowed for easier trading (dumping) of the Rial, as Iranian citizens, investors and speculators have rushed for the exit that is igniting an hyper exponential inflation mega-trend that has sent Iran's annual inflation rate soaring to 55%, and with no sign that the inflationary panic is likely to diminish as the most recent currency plunge feeds through to prices in the shops that ensures that the wage price spiral will continue to accelerate the trend all the way towards hyperinflation despite high unemployment as workers see prices rise, then demand wage increases in line with the price rises else the Iranian elite faces ever increasing waves of demonstrations threatening their hold over power, thus feeding a vicious cycle of further panic selling of the Rial as no one wants to hold a currency that is in perpetual free fall. As things stand Iran is now just as bankrupt (unable to borrow) as any of the euro-zone PIIGS but without any of associated bailouts to lap up Iranian government debt printing to finance spending that its central bank is monetizing to large extent and thus igniting soaring inflation with the situation set to worsen due to the Iranian economy being effectively starved to death of the supply of foreign currency to purchase imports as the sanctions succeed in cutting oil sales by more than 50%. The war against the Iranian elite has been on literally all fronts but is concentrated in the monetary arena via US and European Elites Embargo on any financial institutions doing business with Iran's central bank that manages crude oil sales, as Iran's access to the money markets has evaporated with Iran now mostly unable to leverage the oil it has yet sell let alone produce and sell forward. In response to the economic war that amounts to a series of detonations of monetary WMD's (sanctions) the Iranian central bank has done what ALL central banks would do and are doing to lesser extent, which is to print money and monetize the debt by means of buying Iranian government bonds that finance Iranian government spending in large part siphoned off into the Iranian Elites pet projects and on ever increasing wage demands (wage price spiral) to keep the Iranian masses docile, and the outcome is the soaring Inflation rate we are seeing. Take note delusional deflationists because all of your academic theories that always imply deflation is imminent amount to nothing more than central bank sponsored propaganda DO NOT STACK UP to what actually happens in the real world as is being illustrated by what is taking place in Iran. My last in-depth analysis illustrated at length the inflationary consequences of the global central bank crime syndicate being engaged in a perpetual and accelerating trend of debt and money printing in a policy of QE-4-Ever (Global Central Bank Crime Syndicate QE-4-Ever Inflation). The central bank crime syndicate usually tends to work together, not because they are a club of colleagues but rather bankster's with fingers on the triggers of monetary weapons of mass destruction as they seek to play the game of maximising the theft of wealth for their masters, the the elite and respective governments that they control in their never ending pursuit to keep power over the serving class ( that's you, the 98%). The currency war between central banks is akin to the cold war of ever escalating money supply that competes against one another without triggering outright monetary war that would result in the collapse in confidence of all fiat currency resulting in an hyperinflationary panic event. In the pursuit of the monetary cold war, central banks deploy a number of propaganda tactics at their disposal by conjuring economic statistics out of thin air such as inflation and unemployment data to keep the masses confused, that does not reflect economic reality and propagating economic theories that support their debt and money printing policies such as Keynesianism which is liberally reported on as fact by the elite controlled mainstream media. That and the obsession with exchange rates that gives the illusion of relative fiat currency stability when the reality is that of competing central bankster's ensuring that each of their respective country exchange rates are freefalling together, thus all that the exchange rates exhibit is the volatility the differing rates of free fall as central banks vie for one up-man ship against one another without triggering all out monetary war. Again, whilst Iran may be a more extreme example of the Inflationary consequences of what I have termed as QQE for the elite who have first call on inflation (Central banks monetizing government debt which in effect cancels the debt because the Government is in effect increasingly paying interest to itself that inflates asset prices held by the elite), what it is actually doing in practice is no different to what all western countries have been doing since the announcement of QE policies and what the PIIGS governments are desperately attempting to force the ECB to do to greater degree than the bailouts to date. Hyperinflation panics events are far more common than people imagine, in fact over the past 100 years there have been over 50 such events that tells you something. Well it should tell you that Hyperinflation starts when the elite gets too greedy, the thirst for wealth and power consumes logical thinking until it is too late when many find themselves (not all) that they too fall victim to its destructive consequences, but not before the masses have been slaughtered at its alter. Thus all countries are trending towards Hyperinflation Panic events by virtue of the fact that the elites drunk on total power and greed cannot resist the temptation to steal that little bit more wealth from the serving classes (98%), all the way to when the general population loses confidence in fiat currency (pieces of paper that they do the elites bidding for). Iran appears to be on the verge of having a hyperinflation moment, though the US Elite is playing a dangerous game for the Iranian example potentially opens the eyes of all of the worlds brainwashed masses (985) to what the consequences are of what the Elite are engaged in (QQE money printing), so Elite controlled governments try their hardest via the mainstream media to push propaganda in an attempt at distracting from the real causes of and consequences of government money printing debt monetization programme's, which is an acceleration of the theft of wealth, which is why over the past 4 years of the financial crisis, the wealth of the richest has soared whilst the wealth of the rest has plunged! Buy pushing Iran towards hyperinflation the US and its allies have increased the risk of hyperinflation in their own countries, because all currencies, the US Dollar, Euro, Japanese Yen, or even the relatively small British Pound are all capable of igniting GLOBAL hyperinflation! Which is why the central bank crime syndicate is so eager to perpetuate the illusion of working together because it is more out of fear of Hyperinflation consequences than comradeship, which is why the Elite of the German Empires client states are demanding debt monetization because they understand that if the Euro goes up in smoke (which it will do) Germany goes with it, but what they may not understand is that so would the US Dollar and every other fiat currency in the world! So whilst many western politicians look on at what is happening in Iran with glee, they may regret detonating the Currency War WMD's because the monetary fallout cloud will spread far and wide as the Inflationary consequences ripple out and get leveraged up by sparking wage price spirals everywhere which whilst they may benefit the Elite in the early stages as asset prices soar, however to placate the serving class they will be forced to ignite wage price spiral in response to food prices rises as has already been sparked in India. In time of monetary crisis the elite controlled government via its central bank will accelerate the theft of the general populations wealth by means of Inflation AND direct intervention to seize assets such as foreign currency on deposits in the banks. Therefore as I have been advocating for a year now people need to cut their risk by reducing their exposure to the banking sector, by withdrawing funds and buying physical assets be they precious metals, or property, before it is all stolen either stealthily or overtly as is now taking place in Iran. What's the Future for Iran ? In monetary terms the future will be the same as what happens to all destroyed fiat currencies, the Elite will need to create a new one to once more get the serving classes to slave and die for them under banners of propaganda such as "Death to xyz" all in the name of protecting the interests of the ruling elite. In terms of politics, clearly with Syria's decent into hell as the population rises up against the ruling elite (though to be ultimately replaced by a new elite), the western powers hope to ignite something similar in Iran as an already rebellious population finds itself unable to feed itself, in comparison to what it see's squandered elsewhere on useless expensive nuclear and military programme's. 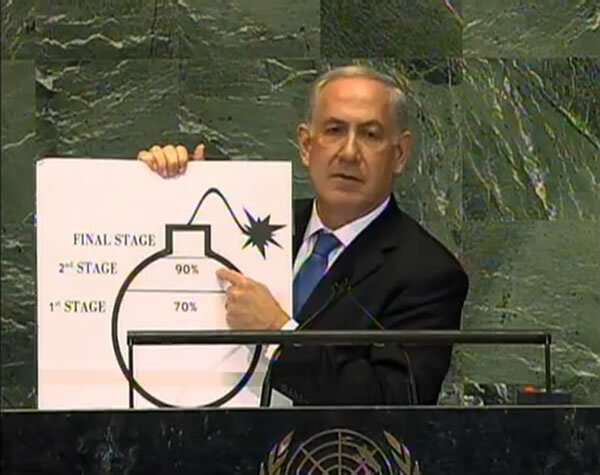 Though the Israeli prime minister warning of imminent attack with dumbed down cartoons reminds the Iranian masses of the nuclear threat the Israel poses to their existence and has the effect of pulling the country tighter together under the influence of the Iranian elite, more willing to endure hardships than would otherwise have been the case. Never mind were Israel to actually carry out it's threats which would suit the beleaguered Iranian elite well, as there is nothing better than a war of aggression for the serving class to unite against and enable the government to crack down on political dissent. Attacking Iran would spark a series of military escalations resulting multiple regional wars and energy supplies being cut that ultimately risks landing the United States, (and most Western nations) where Iran is today, i.e. 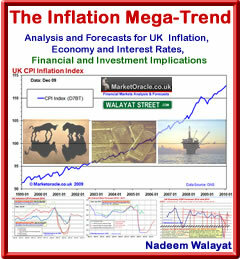 an hyperinflationary panic event as the US Central Bank finds itself in a very similar losing monetary battle as the Iranian central bank finds itself today and THAT is the primary message of this analysis an attack against Iran really would sow the seeds of global hyperinflationary economic collapse as all central banks exponentially ramp up their debt monetization programme's as the elite seize the opportunity to steal everything, they cannot resist it, it is human nature it is why asset prices inflate into bubbles that go pop! Therefore the logical conclusion is that having done the math of what would follow an attack on Iran, the U.S. elite will continue to keep a tight reign on the Israeli elite whilst promoting regime change via an Iranian Spring elite change which remains the most probable outcome. Whilst the logical conclusion is leaning towards the West holding back on military action by letting economic collapse play out. The unforeseen consequences are that in the face of economic collapse hyperinflation, the Iranian elite may deem that War is the only solution to divert the the angry serving classes rage elsewhere, just as the ball was set rolling for World War 2 by Weimar Germany hyperinflation that did away with the old elite and bringing for a new more vicious elite. Please stick to the facts and focus on what you know.Economic and financial analysis.Your forays into geo politics is irrational and baseless. Don't get carried away with silly talk about Iran's domestic problems leading to global hyper-inflation.The Shia fanatics running Iran are willing to die in order to annihilate Israel. Well,then,please take notice if Israel falls to the Shias,Britain and western Europe will soon follow. Wars are initiated between elites for power and wealth, not general populations. I don't see how Iran can annihiliate Israel when Israel is the regional super power armed with 200 nukes. This is not the 1920's in our age, hyperinflation is highly contagious, I am SURE the likes of Bernanke understand this, if not then watch and learn what happens to all fiat currencies including the USD, GBP, Euro because the fiat currency system is already teetering on the very edge of the abyss curtesy of the banksters actions whos consquences have been driving the Inflation Mega-trend that has been manifesting itself whilst the always imminent deflation propaganda has raged in the press and will continue to do so all the way towards Hyperinflation, and still deflationists will insist they were right because hyperinflation follows deflation when in fact there never was any deflation ! 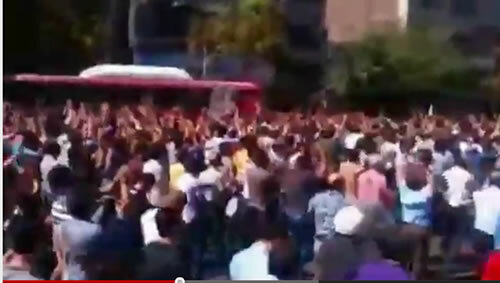 Western governments and central banks will be in just as much denial as the Iranian government is on what is taking place in Iran, so again - pay close attention to Iran, because it gives us an example of the direction we are heading in. Prof. Hanke has noted your interest in Iran, and he asked me to reach out on his behalf. For months, Prof. Hanke has been following the collapse of the Iranian rial, tracking black-market exchange-rate data from foreign-exchange bazaars in Tehran. Using the most recent data, Prof. Hanke estimates that Iran is now experiencing a monthly inflation rate of nearly 70%, indicating that hyperinflation has struck in Iran. Prof. Hanke is currently in Dubai, and he is available to comment on the situation in Iran. Israel is a tiny country,barely 8 kilometers wide at its narrowest point.The reputation of Israel as fighting machine goes back to 1967 and 1973.Since then,Iran has created a powerful proxy army equipped with more than 30,000 missiles capable of hitting every population center in Israel. its southern communities while on its northern border it faces the Syrian air force,trained and equipped by Russia.It's only a matter of time before Israel has to contend with a new threat on its southern border from the Moslem Brotherhood in Egypt. Israel truly faces annihilation from its immediate neighbours in addition to the threat from Iran and the memory of the Holocaust accentuates their insecurity. It appears to me that Israel can only sustain itself if it is continuously involved in conflict with its neighbours. The Israeli elite need an perpetual enemy, a war without end, the last thing they want is peace, for it is peace that really threatens their control over Israeli society by virtue of the fact that the population will come to realise what those in many western countries have come to realise, it was not so long ago we were told that Russia was the enemy, if you look at how many american's viewed the "reds under the beds" even into the mid 1980's you would realise that russians were barely percieved as human! When the reality is that the Russian people desired more than anything else freedom from their oppressive regime, the russian elite. What all peoples want is freedom from their own totalitarian governments, which includes Iran, so Israel threatening Iran works into the Iranian elites hands just as much as it works for the Israeli elite. It remains to be seen how long it takes for the Iranian people to gain their freedom, especially as it hase taken the Egyption people 4000 years! Similarly to imagine that the Palestinian people will never gain their freedom is delusional and when that day comes so will ordinary Israeli's gain their freedom from the perpetual war state that the Israeli elite use to control Israel's population with. (wink wink lol) the UK are yet to hear these chants thanks to the awesome coverage the BBC gave of the Republican primary. What are your thoughts on the petro-dollar, all conspiracy or does it exist.